Steven Seegel (2018): Map Men Transnational Lives and Deaths of Geographers in the Making of East Central Europe. University of Chicago Press: Chicago. More than just colorful clickbait or pragmatic city grids, maps are often deeply emotional tales: of political projects gone wrong, budding relationships that failed, and countries that vanished. In Map Men, Steven Seegel takes us through some of these historical dramas with a detailed look at the maps that made and unmade the world of East Central Europe through a long continuum of world war and revolution. 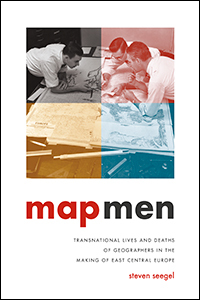 As a collective biography of five prominent geographers between 1870 and 1950—Albrecht Penck, Eugeniusz Romer, Stepan Rudnyts’kyi, Isaiah Bowman, and Count Pál Teleki—Map Men reexamines the deep emotions, textures of friendship, and multigenerational sagas behind these influential maps. Taking us deep into cartographical archives, Seegel re-creates the public and private worlds of these five mapmakers, who interacted with and influenced one another even as they played key roles in defining and redefining borders, territories, nations­—and, ultimately, the interconnection of the world through two world wars. Throughout, he examines the transnational nature of these processes and addresses weighty questions about the causes and consequences of the world wars, the rise of Nazism and Stalinism, and the reasons East Central Europe became the fault line of these world-changing developments. At a time when East Central Europe has surged back into geopolitical consciousness, Map Men offers a timely and important look at the historical origins of how the region was defined—and the key people who helped define it. Third Reich, Knocking on Europe’s Door, Lives of a Salesman. is professor of history at the University of Northern Colorado. He is the author of Mapping Europe’s Borderlands: Russian Cartography in the Age of Empire, published by University of Chicago Press, and Ukraine under Western Eyes. Previous Post Hans-Dietrich Schultz (2018): Der Realraum als Problem. Eine Lektion aus der Disziplingeschichte. Wochenschau Verlag: Frankfurt a. M.